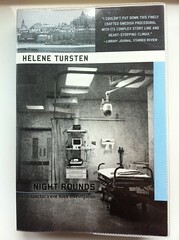 Swedish Detective Inspector Irene Huss investigates the murder of a nurse and death of a patient at a private hospital in Goteborg. A complicated case from the start, things take a turn for the worse as more deaths follow. The original novel was published (in Swedish) in 1999 and it shows its age, particularly in mobile phone usage. The English translation I read, by Laura A Wideburg, is for an American audience – with occasional jarring consequences. Irene Huss’s jujitsu skillset also irritated.